On Game of Thrones Season 7 Episode 7, the Night King finally put his plan in motion as the other factions joined forces...or did they? On Game of Thrones Season 7 Episode 6, there was a lot of loss beyond the wall, but what did it mean for everyone? Find out in our review! On Game of Thrones Season 7 Episode 5, a surprising alliance might have been formed in the name of winning the war. Find out what we thought in our review! 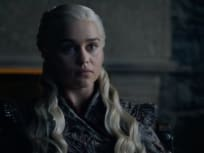 On Game of Thrones Season 7 Episode 4, Daenerys weighed up her military options before unleashing an attack of epic proportions. On Game of Thrones Season 7 Episode 3, it happened: Jon met Daenerys. Also, Cersei got her sweet, incredibly evil revenge. The war kicked off on Game of Thrones Season 7 Episode 2, as we got to see the first big battle of the season. How did it all play out? On Game of Thrones Season 7 Episode 1, the show started to wind down some of the plots, as Daenerys landed in Dragonstone. Did it live up to the hype? Read on! There was a whole lot of death on Game of Thrones Season 6 Episode 10. Who didn't make it out alive? We have the full review for the finale right here! On Game of Thrones Season 6 Episode 9, a tense battle ensued between the bastards, while Meereen continued to burn. Follow the jump for the full review! Game of Thrones Review: Say My Name! On Game of Thrones Season 6 Episode 8, things took a wild turn as a lot of characters found themselves in shock situations. We have the full review! Game of Thrones Review: Returns, Deception & Attempted Murder! On Game of Thrones Season 6 Episode 7, an old face returned, while Sansa and Jon tried to get a bigger army to take down Ramsey, but did they succeed?